Ward's today announced that Nissan LEAF's 100-percent electric, zero-emission drive system is included on its prestigious '10 Best Engines' list for 2011. It is the first time in the 17-year history of the magazine's '10 Best Engines' that the selection committee has chosen a power system which doesn't have an engine and will never burn a drop of gasoline. "We engineered Nissan LEAF to have drive characteristics that would impress drivers, whether you're comparing it with other electric vehicles or those powered by internal combustion engines," said Carlos Tavares, Chairman, Nissan Americas. "The inclusion of Nissan LEAF in Ward's '10 Best Engines' demonstrates that the Nissan LEAF can compete with all top vehicles, no matter the propulsion system." For 2011, 38 competitors were considered, marking the largest group in the history of the award. The competition included both naturally aspirated and forced induction internal combustion engines, diesels, hybrid electrics and the all-electric Nissan LEAF. The editors evaluated the vehicles based on horsepower and torque; noise, vibration and harshness; the engine's technical attributes; and their relevance among direct rivals. The all-new Nissan LEAF features a high-response 80kW AC synchronous motor powered by a 24 kWh lithium-ion battery manufactured at the Automotive Energy Supply Corporation (AESC) operation in Zama, Japan, which is a joint-venture of Nissan Motor Co., Ltd. and NEC Corporation. 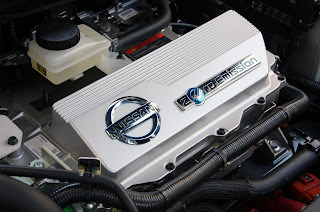 Both motor and inverter have been developed by Nissan, and the power system generates 107 horsepower and 207 lb-ft of torque. The power is transferred to the wheels through a single-speed reduction gear. Unlike a conventional internal combustion engine, Nissan LEAF delivers maximum torque from start, providing smooth, consistent acceleration. Performance in the low-to-medium speed range is equivalent to that of a vehicle powered by a V6 gasoline engine. This power system provides a highly responsive, fun-to-drive experience consistent with consumers' expectations for traditional, gasoline-powered vehicles. The 2011 Nissan LEAF goes on sale this month in selected markets in the United States and will be available nationwide in 2012. The awards will be presented at a Jan. 12, 2011 ceremony in Detroit during the North American International Auto Show. A full story on the 'Ward's 10 Best Engines' is now available on WardsAuto.com.